I was looking over Twitter the other day when something interesting caught my eye: the Travel Whispers Blogger Challenge. Designed by Stephanie Fox, the Travel Whispers Blogger Challenge is a series of questions designed to inspire real-life action, create dialogue between travel writers, and provide insights into the brains of your favorite bloggers. And while Stephanie originally intended for people to answer the questions at the end of 2016, I couldn’t resist giving it a shot (also, Chinese New Year was just a few weeks ago!). Since I was a young child, I’ve fascinated by Japan. I watched my VHS copy of Godzilla vs. the Sea Monster so much as a kid that my parents had to hide it from me, lest they hear screams of “Godzilla is attacking the city” one more time. In grade school, I had a Japanese pen pal who was training to become a sumo wrestler. I even learned to make origami cranes, and drew anime-style comics. As an adult, I’ve grown out of these habits; I’m more interested in Game of Thrones than Godzilla. And I now realize that the Japan I imagined as a kid was more a setting to base my fantasies of robot battles than an actual country. Yet, there’s a big part of me that still wants to explore the Land of the Rising Sun. And so if I had to live in an unseen foreign country for ten years—a span that wound undoubtedly allow me to know the place quite well—I would pick Japan. Undoubtedly, it would be difficult to adapt to life there—I’ve heard the Japanese are often quote dismissive of foreigners—but I believe I could make it work. At the very least, it would provide me with a challenge to overcome! Assuming that I’m allowed to travel from this hotel occasionally, I think I would pick the Hotel del Coronado in San Diego, California. Not only is the weather there perfect—it rarely moves outside of the 70s—but the hotel itself is magnificent. 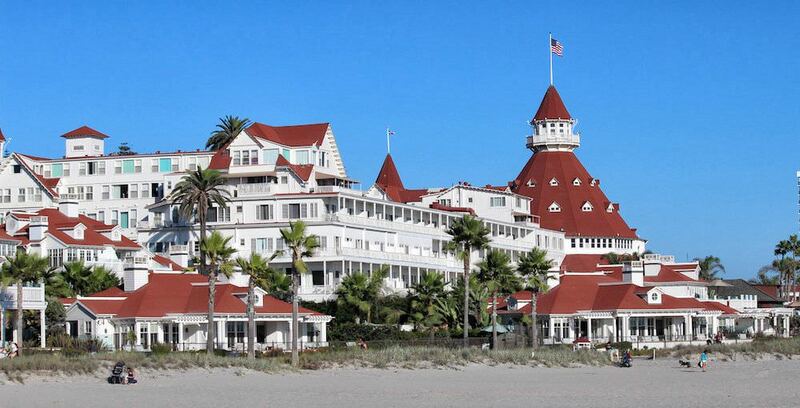 Built in the 1880s, the Coronado has a hosted a who’s who of the last 100 years, including 18 presidents, Thomas Edison, and Katharine Hepburn. The service is excellent, the food fantastic, and the scenic view of the San Diego Bay is hard to beat. If you’d asked me this 5 years ago I’d say Italian cuisine, but having lived there, I know that you can indeed get sick of pasta, pizza, and panini. Instead, I would go with something a bit more varied in flavor: American cuisine. This may be surprising as most people think of American food as being over-processed, bland, and incredibly unhealthy—hardly the qualities you think would make it a desirable answer. I can’t deny that these stereotypes aren’t true, but I can say that they don’t cover ALL American cuisine. As a nation of immigrants, American cuisine builds upon the recipes and culinary secrets of people from around the world. From Creole to Tex Mex, there’s no shortage of variety here. Sure, we may never have the best of any kind of cuisine (save barbecue), but it’s hard to beat the breadth of tastes and aromas you can find in the U.S.—something that would come in hand over the course of a lifetime. This is tough. I try not to get envious of people for their travels, as I find it really counterproductive emotionally. Having said that, I was envious of Cassie De Pecol, who became the youngest person ever to visit every country on Earth. While this goes completely against most of my travel principles—after all, how can you possible learn to appreciate a place when you’re fitting so much into a such a short period of time—I’m still fascinated by the trip itself. How cool must it have been to navigate the cultural differences and logistical issues that arose as she bounced from country to country for over three years. I remember visiting the Grand Canyon as a little kid, and being blown away the kaleidoscope of colors that appeared below as the sun began to set. I’d be tempted to say that my memory of this event’s beauty has been somewhat exaggerated over the years, but a quick Google search seems to say otherwise. I would first insist that any visit to Madison take place in the summer or fall. Do not visit here in the winter; it’s a frozen wasteland. Outside of that, I’d suggest checking out the weekly farmer’s market on the Capitol Square, heading over the the University of Wisconsin’s Memorial Union for a beer, taking a sail boat out on Lake Monona, and going to an American football game at Camp Randall Stadium. I have a super soft spot for hospitality, so this one may be unlike the answer that most people give. The day I arrived in Skopje, Macedonia was quite incredible. Despite my luggage not appearing, I was so excited the entire day. Not only was I reunited with an old friend, but I got to meet his family, and began to experience a culture unlike anywhere else I’d ever been. We ate and drank for hours, and I quickly learned the ins-and-outs of Macedonian food culture. That night, although exhausted, we bounced around the city center, hitting live music venues and dance halls before collapsing over a late-night snack of burek. 2016 was quite eventful for me, so I’ll stick to the biggest thing that I ticked of my list: visiting Iceland. Since I first heard Led Zeppelin’s ‘Immigrant Song’, I’d felt an almost-primitive urge to visit the “land of the ice and the snow, from the midnight sun where the hot springs blow.” And I was not disappointed by Iceland’s surprisingly affordable beauty! Cuba was atop my travel bucket list for 2017, but I just got back from there (note: if you haven’t already, visit Cuba in 2017!) so the next spot on my list is filled by the Baltic States—Estonia, Latvia, and Lithuania. It’s a region of Europe I’ve never ventured to, and considering recent geo-political events, I think I should give myself a first-hand education on life there. Late night snacking in #Graz, #Austria. I took this photo in Graz, Austria near midnight. The men in the center were almost certainly bankers grabbing a late-night snack after some after-work drinks. There’s nothing particularly unique about this image, but it has stuck with me regardless. Perhaps it’s the atmospheric lighting or the subtle statement it makes on globalization in modern Europe. If you enjoyed this, take a look at some of the other bloggers who have taken part in this!